Broke grad students are struggling to make a break through with technology that will harness the mind- what the end up with is technology that allows them inter interact with machines and into enter other peoples minds. Of course it all comes with a price as their invention wrecks their personal relationships and it is discovered by forces who want to harness it's darker potentials. I am really torn about this film. I mean really torn. Don't get me wrong this film is a solid B movie sci-fi thriller. It hits all the right notes, has some really good performances and the score is often creepy. It is a film that on pretty much every level does everything right. Its a film that in it's small inde way has style to burn. It the sort of film that part of me wants to go out and champion and sell to my friends who love science fiction and science fiction thrillers. The problem is that the very people who I want to sell this film to are going to feel exactly as I feel, which is that we've seen this before. Granted in many cases those other variations of a scientist making an invention that messes up his life weren't done as well as this, but we've seen this before. The one that immediately leaps to mind(because I just saw it on TCM) is Douglas Trumball's BRAINSTORM. In that film we have a machine that reads and records thoughts so that people can re-experience what other people have seen. There is the use of the machine for the military and other elements. While it's not exact, LISTENING is reshaping lots of worn cloth into a new coat, there is enough there to say this doesn't feel new. And that's what bothers me, its not so much that I've seen this before, hell I've seen variations of pretty much every film before, it's that it doesn't try to do something new and unique with the story. Too much is borrowed. There was nothing here to set it apart. As I said to my brother in describing the film, it's kind of like watching a Shakespeare play you've sen before. You watch it not just for the familiarity of the words and plot but for the flourishes- did they change the setting or alter inflections. There is nothing worse than seeing Shakespeare that is stereotypically performed in period with cliched performances. You'll go with it but unless there is a standout performance you won't be raving at the end. LISTENING is like that. Its a perfectly made and performed science fiction thriller that you've seen any number of times before. Unfortunately it's not going to be something you remember because there is nothing to set it apart. 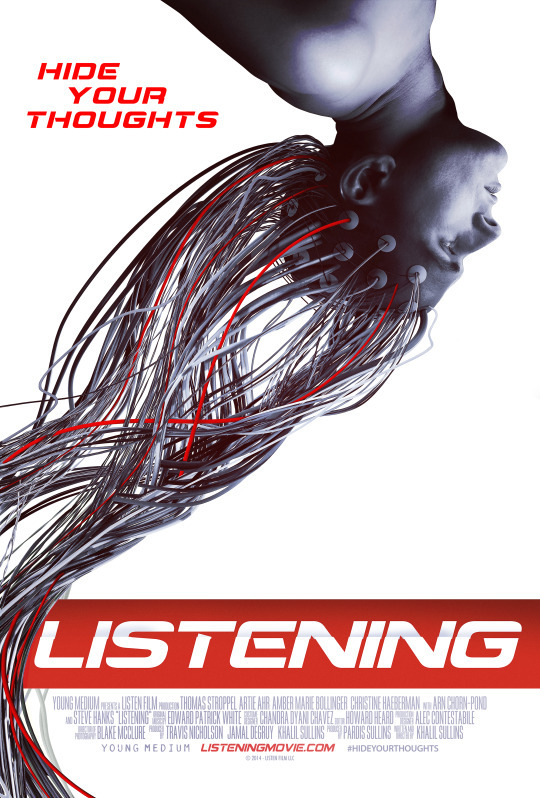 LISTENING hits theaters and VOD Friday. Reviews of THE WALK and THE LOBSTER are coming.